There's always something interesting at a PechaKucha Night (PKN) Bangor. For $5, you'll hear a variety of talks by people in the community, each in the form of 20 images shown for 20 seconds at a time. It's a presentation format that started 10 years ago in Japan and it's become a world-wide phenomenon. 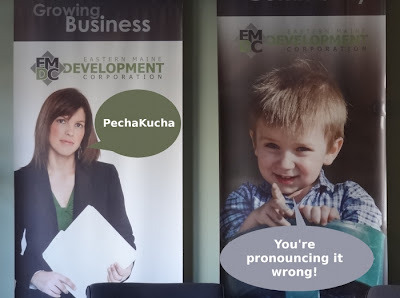 The next Bangor PKN is Friday, November 30th at EMDC (Eastern Maine Development Corporation) located in Downtown Bangor at 40 Harlow Street. Doors open at 6:30pm and presentations start at 7pm.